We’ve reached the end of Pievember, folks! 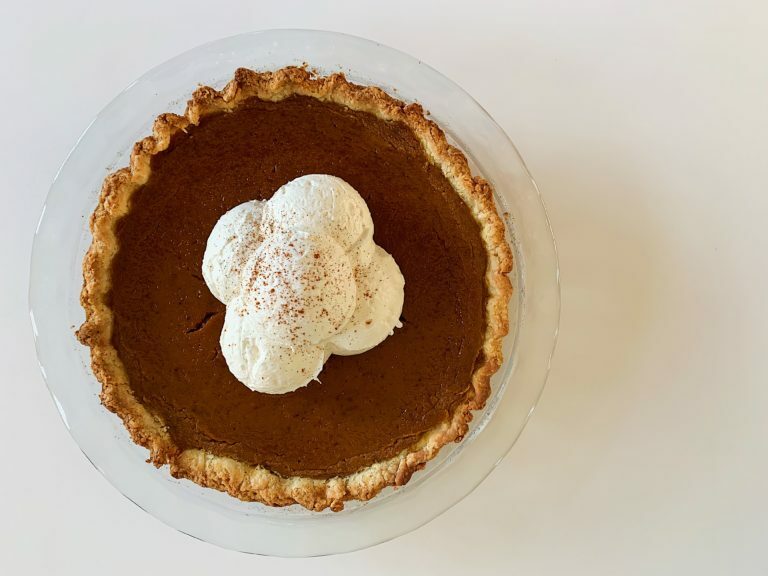 And what better to way to end this fun Thanksgiving recipe roundup than with this pumpkin pie. 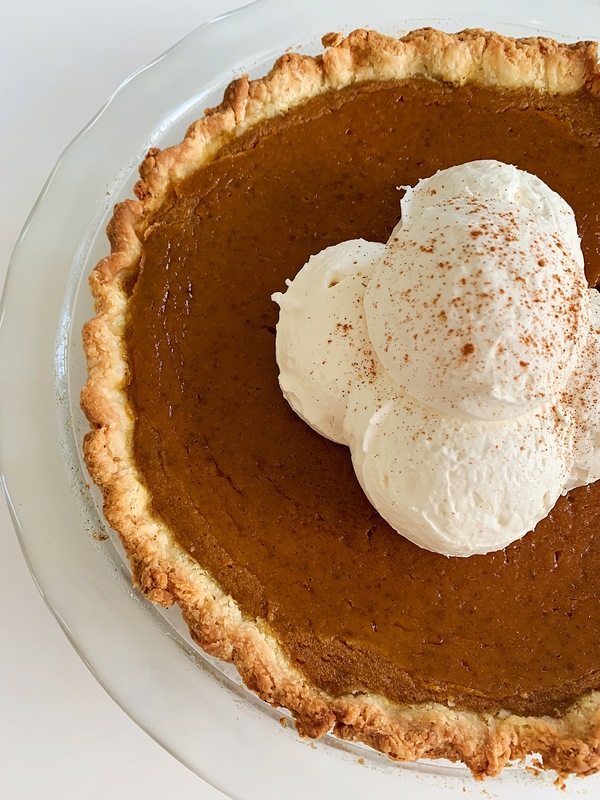 For many people, Thanksgiving wouldn’t be complete without having a pumpkin pie in the spread. I know it’s so easy just to get in the car, hop on down to Costco, and grab a $5-something pumpkin pie. Trust me, I’ve done it before! But just in case you wanted to take a crack at making your own, there’s no better time than now. When it comes to the pumpkin that you use in pie, I’ve heard people go back and forth between canned and fresh puree. Personally, I’ve never tried anything other than canned. Perhaps, in the future, I’ll grab some sugar pumpkins and make with fresh puree. But for now, and for many of us, I think the pumpkin puree tastes fantastic. 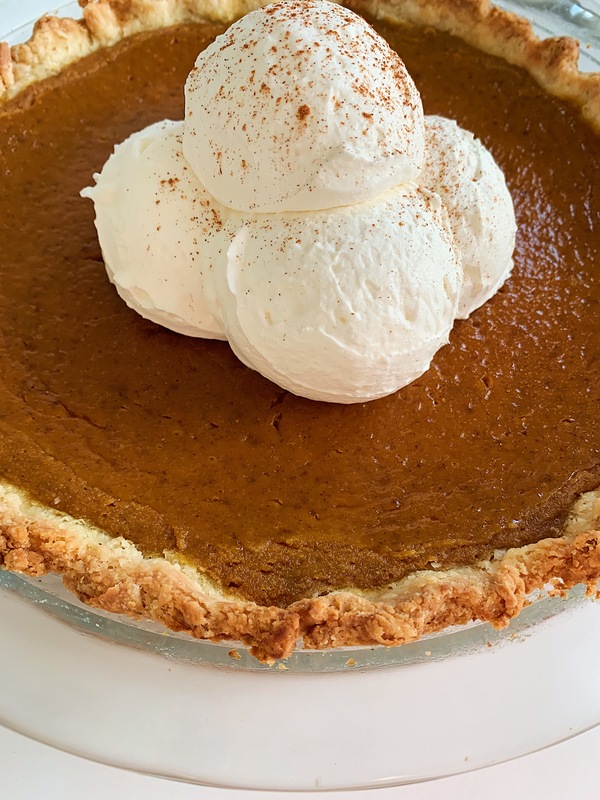 I’m using the same pie crust recipe as I do in my other recipes–just keeping it simple, ya know? The filling is so, so simple to make. Add dry ingredients to one bowl, the wet to another. Combine them both together, dump into your pie shell, and bake! Also, no need to blind bake this pie crust. Even better! I hope you try this recipe, and love it. And many, many thanks for following along with my Pievember adventures this month. It has been a blast making these pies and sharing them with you all. I hope you have a happy, fantastic, safe and cozy Thanksgiving! 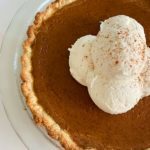 Easy, delicious, and simple--a true Thanksgiving classic! Start by adding the flour, sugar, and salt into the bowl of a food processor. (If you don't have a food processor, that's okay--you can do this with a pastry cutter.) In a separate, small bowl, whisk together the sour cream and water until smooth and set aside. Sprinkle the small butter pieces evenly over the dry ingredients, then pulse a few times until the butter is the size of peas. Add the sour cream mixture into the bowl of the food processor while you pulse a couple of times. Pulse the dough a few more times. To test if the dough is ready, press it together with your fingers. If it sticks together, it's ready. If not, add a tablespoon or two of ice water. It should start to form bigger clumps. Dump the dough out onto a well-floured surface and use your hands to press the dough crumbles into a ball. It is going to seem messy, but this just means you're going to have awesome, flaky crust. Wrap the ball in plastic wrap and let it chill for an hour. Remove pie dough from the fridge. Roll out into a 12" or so circle, and place inside a deep dish 9" pie plate. Trim off any excess dough and crimp the edges. Place pie shell inside the fridge to chill for 30 minutes. In a bowl, combine sugars, flour, salt, and spices. Make sure there are no large chunks of sugar and that everything is mixed well together. In another larger bowl, combine eggs, pumpkin, half and half, and vanilla. Mix until the wet ingredients are incorporated well. Add the dry ingredients into the wet ingredients and stir well. Pour into pie shell and bake for 40-60 minutes. The pie is done when the temperature in the middle is 165 F. The middle will still be wobbly, but it will continue to set as the pie sits. Serve with whipped cream, if you would like. Enjoy!